Native to warm and tropical regions across the planet, parrots are a diverse bird species with a high level of intelligence. Their sharply curved beaks and colorful feathering are among their most readily identifiable physical characteristics. African grey parrots are particularly smart, displaying the ability not only to mimic human speech, but also to build vocabularies of several hundred words. 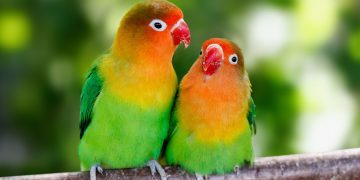 Other popular variants include conure parrots and eclectus parrots. Given the incompleteness of parrot fossil records, the origin of the species is a matter of conjecture and debate. The species appears to have originated in Australasia, and there’s evidence to suggest their evolutionary ancestors were present on Earth as far back as the time of the dinosaurs. Size: Parrots display the most variation in body size of any species of bird. Hyacinth macaw parrots grow as large as 3.3 feet in length, while other parrot species are as small as 3 inches. Quaker parrots grow to an average of 11 inches. Senegal parrots are usually about 9 inches from beak to tail, and Amazon parrots range from small (spectacled Amazon parrots) to medium (yellow-headed and mealy Amazon parrots) in size. Plumage: The color of parrots encompasses a complete range of hues, from blue and green to the vibrant red and orange seen in more exotic breeds. Scientists have recently isolated a unique pigmentation in the parrot species that’s found nowhere else in nature, which contributes directly to parrots’ brilliant, rich colors. Song/Chirp: All parrot species display a distinctive, short whistle and squawk. Their voices are scratchy and high-pitched. Most parrot species that are kept as pets have the ability to mimic human speech, though it’s a skill that must be conscientiously taught through practice. 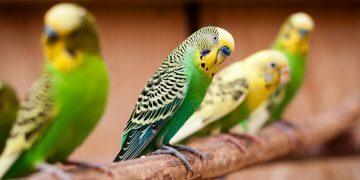 Even domesticated parrots often behave aggressively towards other birds, so it’s not a good idea for a parrot to share a cage with another pet. During the springtime mating season, males can become unruly and unpredictable, so it’s a good idea to train the bird to perch on your hand or arm, rather than on your shoulder, to prevent accidental injury. Feeding: In the wild, all parrot species eat seeds, insects, pollen, nectar and fruit. The nutrients they receive from these food sources must be replicated in the enriched bird food they’re fed, or they’ll be at risk of developing malnutrition-based illnesses. Your local pet store will have healthy supplies of parrot food for sale. Grooming: Fresh bath water is essential, and nail trimming should take place regularly. Nail length can be moderated by providing your pet parrot with a sandy or concrete perch. 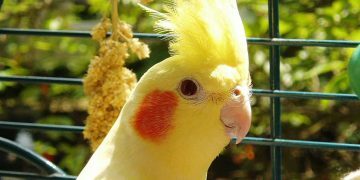 Their sharp beaks must also be trimmed when they get too long, but this isn’t a task you should perform yourself since vital blood vessels are located close to the beak. Take your bird to an avian vet when beak trimming becomes necessary. Health Concerns: If you have cats as well as birds, bear in mind that felines carry Pasteurella bacteria, which can be deadly for your parrot. This bacteria is spread when your cat comes in direct contact with your bird or its water or food sources. Take your parrot to the vet immediately if direct cat-bird contact takes place; otherwise, your bird could die. Chocolate, coffee, avocado and salt are also highly toxic to parrots, so be sure your bird doesn’t come into contact with these food items. Life Expectancy: Large birds tend to live longer. Most domesticated parrots reach an age of at least 30 to 50 years, though the oldest pet parrot on record survived to be 80 years old.